A far cry from old-fashioned golf sweaters, the diamonds in this knitted argyle sweater are reinterpreted with a feminine flair. Scattered across a dark background, each jewel sparkles in hand-painted yarn. Three-quarter-length sleeves and a bateau neckline offer a ladylike finish. Row 1: *K1, p1; rep from * to end of row. Row 2: Purl the knit sts and knit the purl sts. Rep Row 2 for patt. With smaller needle and MC, CO 132 (140, 148, 156) sts. Work back and forth in seed st until piece measures 2-1⁄2″ from beg, ending with a WS row. With larger needle, work in St st for 4 (8, 12, 16) rows as shown on chart, dec 1 st at end of first row — 131 (139, 147, 155) sts. Cont foll chart outline corresponding to your size. 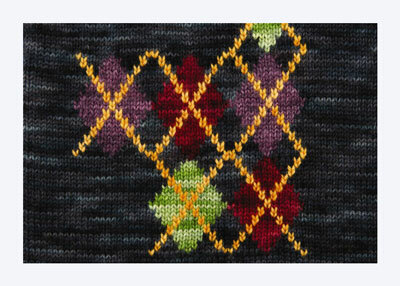 Work even, including intarsia motifs as indicated on chart, through Row 134 (136, 138, 140). BO 7 sts at beg of next 2 rows — 117 (125, 133, 141) sts. BO 4 sts at beg of next 2 rows — 109 (117, 125, 133) sts. Dec 1 st at each end of next 7 RS rows — 95 (103, 111, 119) sts. Work even, foll the chart outline corresponding to your size, to Row 204 (204, 206, 206). As indicated on Row 205 (205, 207, 207) of chart, work 35 sts in patt. BO 25 (33, 41, 49) sts, work to end of row — 35 sts each side. Cont working on right shoulder only, foll chart. BO 3 sts at beg of next 3 RS rows — 26 sts. Dec 1 st at beg of next 5 RS rows — 21 sts. Work 2 rows even. BO 7 sts at beg of next 3 WS rows — no sts. Beg with a WS row, reattach working yarn to left shoulder. Cont working in patt according to chart, reversing neckline and shoulder shaping. With smaller needle and MC, CO 132 (140, 148, 156) sts. Work in seed st until piece measures 2-1⁄2″ from beg, ending with a WS row. With larger needle, work back body through Row 134 (136, 138, 140) of chart, dec 1 st at end of first row, foll the chart outline corresponding to your size — 131 (139, 147, 155) sts. Beg with Row 135 (137, 139, 141), BO 7 sts at beg of next 2 rows — 117 (125, 133, 141) sts. BO 4 sts at beg of next 2 rows — 109 (117, 125, 133) sts. Dec 1 st at each end of next 7 RS rows — 95 (103, 111, 119) sts. Work even, following the chart outline corresponding to your size, through row 174. 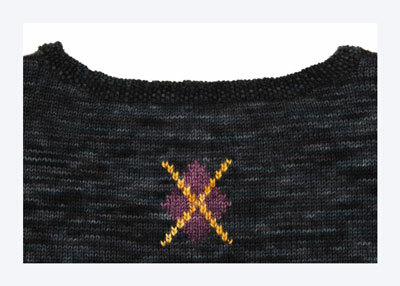 Work intarsia motif as indicated, beg on Row 175. As indicated on Row 217 (217, 219, 219) of chart, work 33 sts in patt. BO 29 (37, 45, 53) sts, work to end of row — 33 sts each side. Cont working on left shoulder only, foll chart. BO 4 sts at beg of next 3 RS rows — 21 sts. BO 7 sts at beg of next 3 WS rows — no sts. Beg with a WS row, reattach working yarn to right shoulder. Cont working according to chart, reversing neckline and shoulder shaping. With larger needle, CO 59 (63, 67, 73) sts. 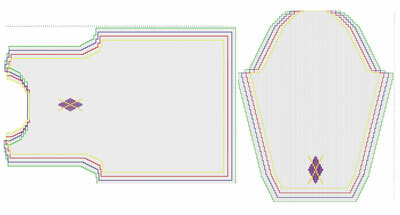 Work in St st for 4 (8, 12, 16) rows, then work intarsia motif as indicated on chart. At the same time, inc 1 st at each end of every RS row 7 (8, 10, 11) times — 73 (79, 87, 95) sts. Inc 1 st at each end of every other RS row 20 (21, 21, 21) times — 113 (121, 129, 137) sts. Work even through Row 112 of chart. Beg with Row 113 of chart, BO 7 sts at beg of next 2 rows — 99 (107, 115, 123) sts. BO 4 sts at beg of next 2 rows — 91 (99, 107, 115) sts. Dec 1 st at each end of next 20 (19, 18, 18) RS rows — 51 (61, 71, 79) sts. BO 2 sts at beg of next 6 (8, 10, 10) rows — 39 (45, 51, 59) sts. BO 3 sts at beg of next 2 (0, 2, 2) rows — 33 (45, 45, 53) sts. BO 4 sts at beg of next 2 (4, 2, 2) rows. BO rem 25 (29, 37, 45) sts. 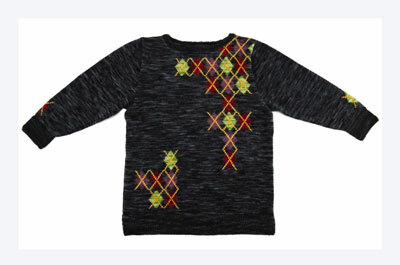 Make a second sleeve to match, changing color of intarsia motif if desired. Work duplicate st on all pieces as indicated on chart. Weave in ends and block pieces. Sew shoulder seams. Sew body side seams, leaving seed st band at bottom open at sides to form slits. Sew underarm seams on sleeves. 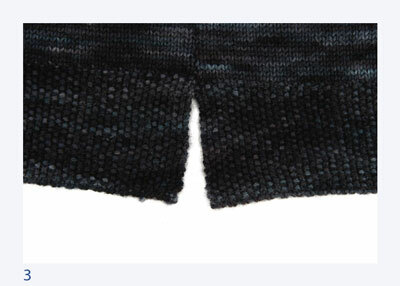 With DPN and MC, pick up and knit 58 (62, 66, 72) sts along lower edge of cuff, beg and ending at center of intarsia motif. Working back and forth in rows (to form a slit), work in seed st until cuff measures 2-1⁄2″ from pickup row. BO in patt. Rep for 2nd cuff. With smaller circular needle, pick up and knit 146 (162, 178, 194) sts along neck edge, beg and ending at left shoulder. PM and join for working in rnds. Work in seed st for 6 rnds (about 5⁄8″). BO in patt. Weave in ends and steam edgings lightly to block.